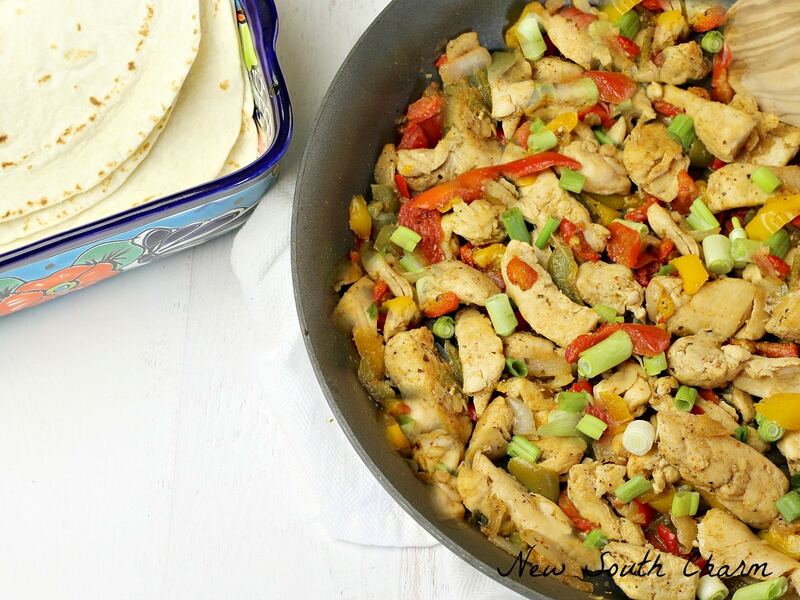 Everyone will love these 30 Minute Chicken Fajitas but you’ll love them the most because they only take a half hour and there’s only one pan to clean. I know I’ve said it before but LOVE Mexican food. Usually I make tacos or nachos but lately we’ve gotten tired of the same old routine. The other day we were eating at our favorite Mexican restaurant and my husband ordered fajitas. I couldn’t stop thinking about that sizzling platter of chicken and veggies. They just looked and smelled so good. So when I went to the grocery store the next week I picked up the ingredients I need to make fajitas. I used a big shortcut to save time on this recipe and I’m going to let you in on it too. I bought a bag of frozen sliced onions and peppers. I didn’t even bother to defrost them I just dumped them in the skillet and cooked them. Doing this probably saved me 10 minutes and it couldn’t have been easier. Okay, now that’s I’ve told you little secret to save time here’s how I made these delicious fajitas. Begin by slicing 4 chicken breasts into 1 inch pieces. Add sliced chicken to a warm skillet coated in olive oil. Season with salt and pepper and cook, stirring frequently, until chicken is longer pink. Add bag of sliced vegetables to skillet continue cooking until veggies are tender and onion translucent. Add fajita seasoning into the mixture stir to combine evenly. Reduce heat to low cover the skillet with a lid and simmer for ten minutes. 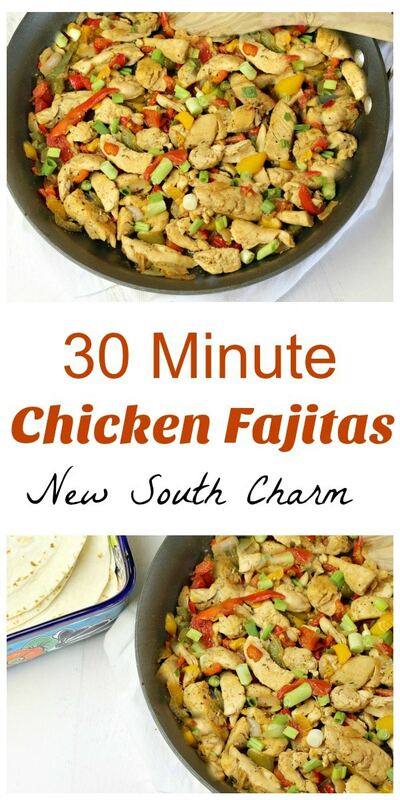 Remove fajita mix from heat and serve on tortillas. Garnish with sour cream,avocados, jalapeños, scallions, cheese or any other topping you like. In a large skillet over medium heat warm up coat skillet in olive oil. 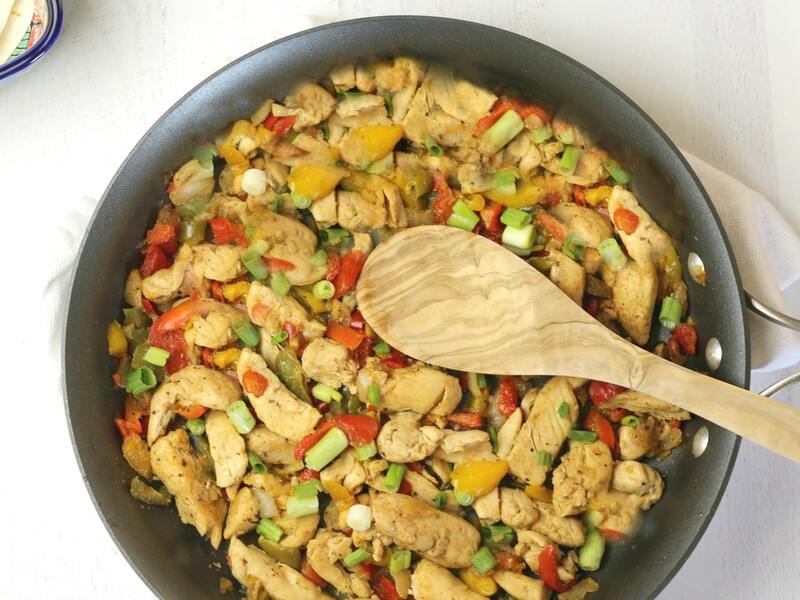 Place sliced chicken in skillet and cook stirring occasionally to ensure even cooking. When chicken is no longer pink turn down heat and add vegetables. Cook vegetables until soft and onions are translucent. Stir in seasonings then cover and simmer for ten minutes. 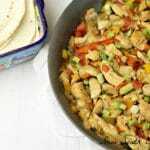 Remove chicken and vegetables from heat and serve on tortillas. Garnish with sour cream,avocados, jalapeños, scallions, cheese or any other topping you like. Hi Susanne! I love how simple and quick this is. I’ll have to look for frozen peppers and onions. 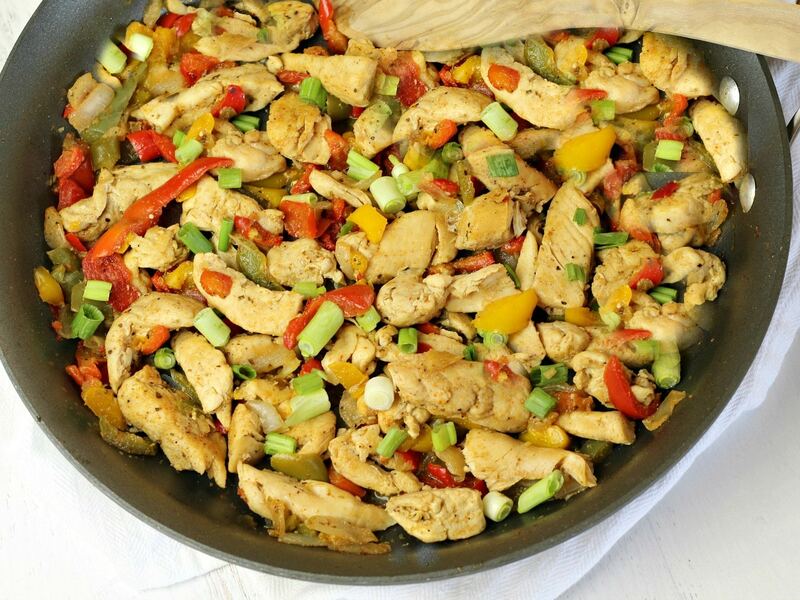 This is a great recipe for Chicken Fajitas, we will love it. Thanks so much for sharing with us at Full Plate Thursday. Have a great weekend and come back soon! We tend to have Taco Tuesday at our house, but I will have to remember this recipe. We love fajitas. Sometimes while the onions and peppers cook, I slice up a rotisserie chicken. Opposite time saver.